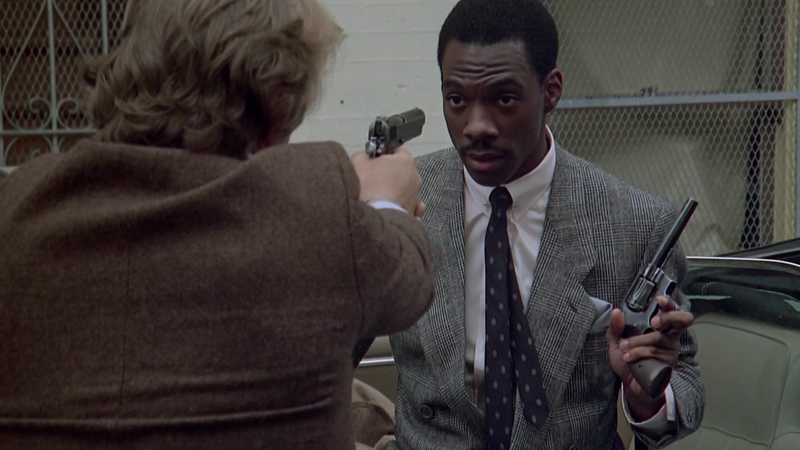 One of Eddie Murphy's earliest hits and one of the original buddy movies, 48 Hrs. provides some edgy entertainment but has a reputation that has perhaps surpassed the actual strengths of the material. While on highway chain gang duty, convict Albert Ganz (James Remar, most famous for his role as Ajax in The Warriors) shoots two guards and escapes to freedom with the help of an accomplice. Arriving in San Francisco to seek the hidden money from the robbery that landed in him in jail, Ganz is soon cornered by the police in a seedy motel but shoots his way out after disarming burly police officer Jack Cates (Nick Nolte). With two police officers now dead in addition to the prison guards, Ganz is a most wanted man, and Cates secures the release of Reggie Hammond (Eddie Murphy), one of Ganz's old accomplices, from jail for 48 hours to help end the killing spree. Jack and Reggie are like oil and water, and while Jack is desperate to catch up with Ganz, Reggie is desperate to get laid during his brief taste of freedom. Eventually the two men earn some mutual respect and close in on Ganz as he closes in on the money. 48 Hrs. has not aged terribly well. The plot was never the point, and it does not get better with time: that the only way to find a vicious and trigger-happy maniac tearing through the city and killing multiple police officers is to seek the help of a criminal who has been languishing in jail for two years defies all logic and the reasonable abilities and motivations of most police forces. Which leaves us with the buddy dynamics between Nolte's police officer Jack, and Murphy's convict Reggie. It is a foul-mouthed, violence-prone relationship that is surprisingly lacking in wit or sharp laughs. As one of the original buddy movies 48 Hrs. was establishing the template rather than improving upon it, but the lack of ideas in the script is a bit painful, as is the over-dependence on Murphy's antics. Five different writers had a hand in the screenplay, including director Walter Hill, and the lack of a confident, purposeful tone is obvious. 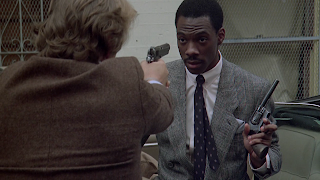 The scenes that work best allow Murphy to take centre stage, as in the red-neck bar with Reggie pretending to be a cop, but even then, the comedy is contrived, with the support actors waiting on cue to bend over and be the punch line of Murphy's cool jokes. Nolte brings little that is new to the role of the lone cop doing things his way, with everything from his sour demeanour to his strained relationship with his girlfriend (an under-used Annette O'Toole) to his beat-up car borrowed from countless other movie and television cops. 48 Hrs. makes good use of the San Francisco locations, and the Murphy persona benefits from the freshness of talent being discovered rather than over-exposed. But while it's a movie that remains engaging, with the passage of time 48 Hrs. is looking quite ragged around the edges.